Electrolux has been designing and improving the vacuum cleaner for decades. The thoughtful design and innovative features make Electrolux vacuum cleaners among the best floor care appliances on the market today. 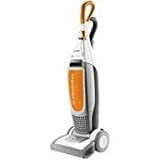 Electrolux makes three classes of vacuum cleaners including Electrolux lightweight vacuum cleaners, Electrolux upright vacuum cleaners, and Electrolux canister vacuum cleaners. No matter what kind of flooring surface you have in your home, there is an Electrolux floor care appliance for the job. Electrolux products can be purchased from retailers including Target, Wal Mart, Bed Bath & Beyond, Sears, and many others as well as online from the Electrolux website or online retailers like Amazon. Below are some of the most popular Electrolux vacuum cleaners available to the consumer. Electrolux lightweight vacuum cleaners are the appropriate product if you want to clean bare floor surfaces or delicate area rugs. They are not appropriate for thick pile carpets. The two types of lightweight vacuums by Electrolux are the Unirapido and the Ergorapido. Both models are cordless machines that run on batteries. The Unirapido pictured above has a 12 Volt NiMH battery that provides twenty minutes of power at normal speed while the Ergorapido model pictured above has an 18 Volt Lithium Ion battery that provides thirty minutes of power at normal speed. Not only does the 18 Volt battery last longer, but the Lithium Ion technology means that it will charge four times faster than the NiMH battery. Some of the differences between the two Electrolux lightweight vacuum models have to do with the versatility of the machines. For example, the Ergorapido Electrolux lightweight vacuum is a two in one model that can be used as a stick vacuum or a handheld vacuum depending on where you need to use the Electrolux vacuum. In addition, the Ergorapido model comes with two attachments to aid in the cleaning of upholstery and hard to reach corners and stairs. The Unirapido, however, has a much larger dust capacity. The dust collection container on the Unirapido Electrolux lightweight vacuum cleaner is one quart compared to the 0.4 quart dust collection container on the Ergorapido. Electrolux also makes two lines of upright vacuum cleaners known as the Nimble line and the Versatility line. The main difference between the two lines of Electrolux upright vacuum cleaners is the fact that the Electrolux Nimble comes with swivel steering making it easier to maneuver around furniture and into hard to reach places. Other than that, the only real difference between the two lines of Electrolux upright vacuums is an aesthetic one. Both Electrolux vacuum cleaner models have a 12 Amp cyclonic suction system and bagless dust collection. They both have a quick release wand and hose that allows you to stretch up to fourteen feet away from the base when cleaning. Both vacuum cleaners models by Electrolux can be used on floor surfaces of various kinds including hard floors and carpets. Both vacuum cleaners by Electrolux have a HEPA filtration system, but the Nimble models have washable filters while the Versatility models have an additional anti-odor filter which makes them good vacuum cleaners for pet owners. Electrolux makes several different varieties of floor care appliances that are referred to as canister vacuum cleaners. The two pictured above are the UltraActive and the UltraSilencer. The UltraSilencer gets its name because of the sound dampening technology used in this Electrolux vacuum model. The machine operates at less than 65 decibels which is the noise level of regular conversation. Another difference between the two featured models is the fact that the UltraActive is a bagless unit while the UltraSilencer uses dust collection bags. The UltraActive is also more powerful with a 12 amp power supply than the UltraSilencer with a 9 amp power supply making it more appropriate for all floor surfaces while the UltraSilencer is only used on hard floor surfaces and low pile carpets. The UltraActive is slightly more convenient to use because the controls are on the handle rather than on the canister and the hose length is slightly longer. Both Electrolux machines have 21 foot electrical cords but the UltraActive has a wider cleaning path so you can clean more carpet before needing to move the canister. Both models come with many accessories and tools that make them appropriate for use with upholstery and hard to reach places. Oreck vacuum cleaners are among some of the best vacuums in the industry. A company that began in the sixties by making vacuum cleaners for use in hotels, Oreck has grown into a common household name. Homeowners who want durable, lightweight, and powerful vacuum cleaners trust in Oreck. Oreck vacuums come in both upright and handheld models. That means that there is an Oreck vacuum to clean every carpeted room or area in your home. 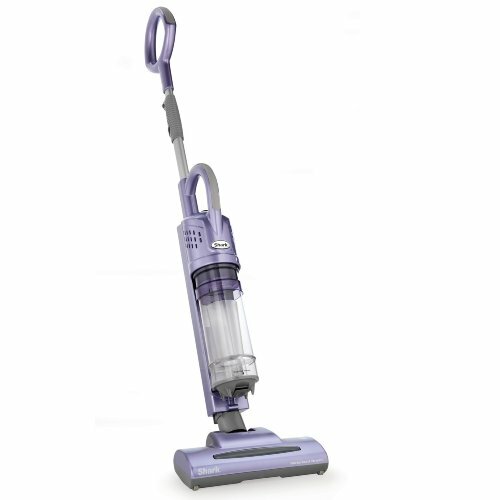 Most upright models are sold as part of a package where the consumer gets both an upright Oreck vacuum and a handheld Oreck vacuum. 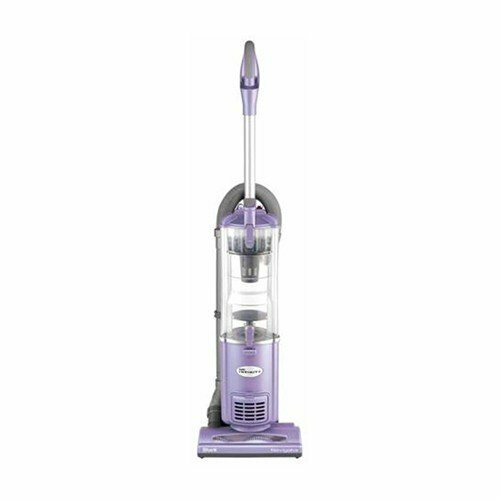 The Oreck Platinum Pilot has many features that make it a superior vacuum for the home. 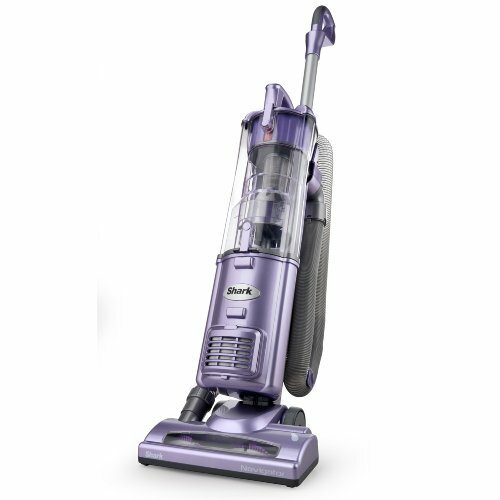 First, the Oreck Platinum Pilot weighs approximately ten pounds which is extremely lightweight for a full size vacuum. The lightweight vacuum not only makes it easy to get the vacuum in and out of storage, but also contributes to its amazing maneuverability. The Oreck Platinum Pilot has a ball-joint and pivot connection design which means that it can turn easily around corners and piece of furniture. Its low profile also contributes to being able to maneuver around furniture easily. Another feature of the Oreck Platinum Pilot is the powerful vacuuming ability. The Platinum Pilot is equipped with a pile-lifting roller brush that gives an increase in pick up performance. The powerful brush rotating at 5600 rpm and the 1023 mph airflow produced by the Pilot mean that this vacuum cleaner is a more efficient cleaning tool than most vacuum cleaners on the market. Finally, the Oreck Platinum Pilot vacuum cleaner, like all Oreck vacuum cleaners, comes with an annual tune up every year for ten years. The tune up is completed at your local Oreck store and includes replacing parts that wear, cleaning important parts, and checking all electrical connections to ensure the vacuum runs properly. The Oreck XL Gold Series vacuum is similar to the Pilot in many ways, but there are some features that are missing. First, the Gold Series does not have the ball-joint and pivot connection design so it is not quite as maneuverable. However, it still has a low profile and wide cleaning path. The Oreck Gold Series also has one pass cleaning, like the Oreck Platinum Pilot. One pass cleaning means that you can clean carpet or floors with only one pass and it is easy to switch from one surface to another. The Oreck Gold Series vacuum has a slightly different kind of roller brush. Instead of the pile-lifting roller, there is a double helix roller that works just as well. The double helix roller just doesn’t move as easily through thick carpets. However, just like the Pilot the Gold series has two speed motor that allows you to vacuum both delicate carpet fibers you might find in a Persian rug and heavy piled carpet. The Oreck Gold Series vacuum cleaner comes with six annual tune ups rather than ten, but that is still an excellent amount of protection. In addition, the Gold Series, like all Oreck vacuum cleaners, comes with a risk free thirty day trial which means you can return the product if you are not happy with it within thirty days of your purchase. 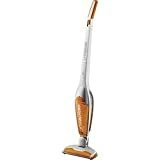 The Oreck SL Silver Pro Series vacuum cleaner is very similar to the Gold Series, but cost about one hundred dollars less. The main differences between the two models are the speed of the double helix roller brush which is 5600 rpm in the Gold Series and 6500 rpm in the Silver Series and the number of annual tune ups offered which is six for the Gold and three for the Silver. Other than some aesthetics, those are the only difference between these two models. Just like the other Oreck vacuum cleaners, the Oreck Silver Pro comes with an inner HEPA bag that traps dust, allergens, and other small particles. 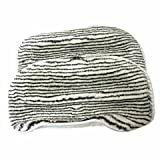 This feature is especially nice for homeowners with pets because it is good at trapping dander and pet hair. The Oreck Silver Pro vacuum also has the Saniseal system like all other Oreck vacuum cleaners. The Saniseal system creates a strong seal around the filter bag to ensure that no dirt or particles escape once they are vacuumed up. 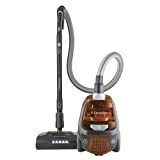 The Oreck SL Element Pro Series vacuum cleaner is an introductory model that is great for a household that is on a budget but still wants a powerful vacuum for cleaning. This model has only a one speed motor, so it might not be safe to use on more delicate carpet fibers but it works extremely well on the most common carpet fibers. 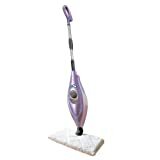 It has a double helix roller brush that rotates at 6500 rpm and comes with one pass cleaning technology like all other Oreck vacuums. The Element Series comes with only one annual tune up, but this nine pound vacuum is a great way to introduce the power of Oreck to your home. Like all other Oreck vacuum cleaners, the Element Pro Series comes with edge brushes that reach all the way to the baseboard when you are vacuuming next to a wall. The Oreck Deluxe Handheld vacuum cleaner is a wonderful tool to have in your cleaning arsenal because it is so lightweight and has so many different attachments that you can take it almost anywhere. The handheld vacuum weighs around five pounds without all the attachments and you can either carry it in your hand or wear it over your shoulder. The attachments include a dusting brush, a floor tool, and a crevice tool. The Deluxe handheld from Oreck also comes with a telescoping wand and a forty two inch hose. The versatility that these attachments give you as a homeowner mean that you can clean any piece of furniture, any small carpeted area like stairs, or hard to reach areas like in between pieces of furniture or along baseboards. The Oreck Deluxe Handheld vacuum cleaner comes with the Oreck Gold, Silver, and Element Series as a package when you buy from an Oreck store or online at the Oreck website. These packages are a great deal because you would spend on average about one hundred fifty dollars more if you bought the items separately. 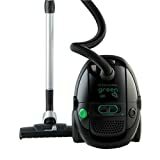 The Ultimate Handheld Vacuum Cleaner by Oreck is very similar to the Deluxe version. The major differences are in the attachments. The Ultimate Handheld Oreck Vacuum Cleaner comes with a longer hose attachment at five feet and the floor tool features plush horsehair fibers that make it appropriate to use on even the most delicate carpet fibers. This model of handheld vacuum by Oreck also comes with a tool caddy for easy carrying of your attachments. It is much easier to keep track of everything and have the attachment you need at your fingertips with the tool caddy. The Ultimate handheld vacuum comes with the Platinum Pilot upright vacuum package. 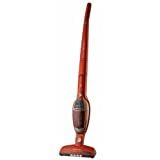 The Oreck Ironman handheld vacuum cleaner is the top of the line handheld vacuum offered by Oreck. This model comes with a two speed motor so it is a good tool to use on both durable and delicate carpet fibers and upholstery. This Oreck handheld vacuum weighs a little bit more at seven pounds, but it comes with wheels so that you can put it on the ground and have it travel behind you as you clean. The accessories and attachments are easily accessible because they attach to the base but they do not get in the way when the vacuum rolls from room to room either. If your home has mostly hard floor surfaces rather than carpet, then you need a piece of cleaning equipment that is lightweight, versatile, and powerful to keep all your floors looking good. A steam mop is the perfect solution because it fits that description perfectly. Most steam mops weigh less than ten pounds so that they are easy to carry from room to room and easy to use as well. They are appropriate for cleaning all kinds of hard surfaces such as ceramic tile, vinyl, laminate, stone, marble, or sealed hardwoods because they do not use any harsh chemicals that could damage the floors. In addition, the steam mop machines usually do not leave a lot of water behind so there is no risk of damaging your floors that way either. Finally, steam is a great natural cleaner. It is hot enough to kill most bacteria that can be found on your floors and it will break up almost any stain. A steam mop has an electrical cord because you need power in order to heat the water to make steam. Most steam mops have steam on demand meaning that the steam is dispensed with the push of a button on the handle. However, certain models work slightly differently. The Euro-Pro Shark S3501 Deluxe Steam Pocket Mop, for example, dispenses steam whenever the mop moves in a natural mopping motion. That gives you a continuous supply of steam as you mop the floor. With this Shark steamer you do not have to worry about how much steam to dispense because the mop does it for you. With all steam mops, the longer you dispense steam with the mop in one position, the hotter that area of the floor will get. Therefore, if you have a particularly bad stain or an area that you are particularly concerned about when it comes to bacteria, you should hold the mop in place and push the steam button. Some steam mop manufacturers recommend eight second of continuous steam to reach an appropriate temperature. With the Shark steam mop, you can pump the handle to dispense steam while it is in place since normally the steam is dispensed when the mop is in motion. Some people might be concerned about the longevity of a product like this because over time and after much use, most mop heads wear out and the mop needs to be replaced. 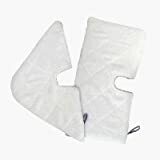 Steam mops come with reusable mop pads that are usually washable so that you do not have to buy a new mop every time the pad wears out. You can remove the pad after each use and wash it. Some mop pads are machine washable and others have to be washed by hand. If a pad does wear out then you can replace it instead of replacing the entire mop. Certain brands of steam mops have special mop pad features that make them more desirable than others. For example, the Eureka! Magic cloths are machine washable and can be washed just like any other piece of laundry. 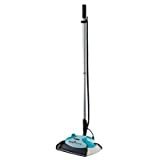 The Bissell Deluxe Mop Pads for the Bissell Steam Mop have a ribbed bottom and are thicker than other brands so they are more durable and better at scrubbing hard stains and rougher surfaces such as slate tile. The Shark mop pads come in different shapes to go with the interchangeable mop heads. The Shark Pocket Steam Mop has a rectangular and a triangular head and there are mop pads to match both orientations. Shark is one of the brands that have been developed by Euro-Pro Operating, LLC in order to provide easy to use products that make every day cleaning easier for the consumer. Shark mops and vacuums are lightweight and efficient so that you can keep your house looking clean in less time and with minimal effort. Shark makes both upright vacuums, cordless uprights, and cordless hand held vacuums so that you can address any kind of mess in your house. 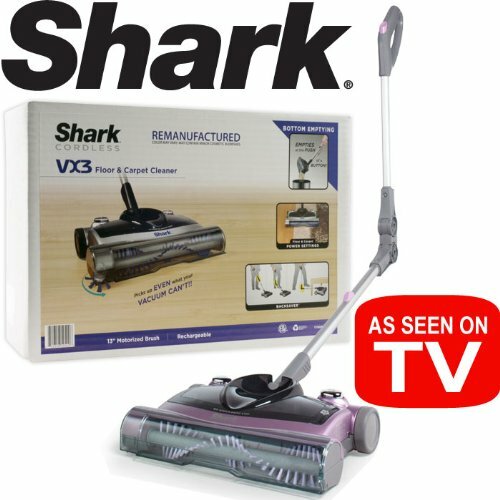 The two Shark upright vacuums pictured above have at least on feature in common and that is that they both use Shark’s No Loss of Suction Technology. This patented technology allows the dirt and debris that is sucked in through the vacuum to be pulled away from the filter in order to avoid clogs and any loss of suction. Continuous suction will ensure that you pick up everything in your path without leaving crumbs or pieces behind like you do with many vacuums if you are not able to maintain suction. The two upright vacuums, while similar in name, also have many differences. First, the Navigator Lift Away has swivel steering so that it is easier to maneuver than the Navigator as well as most traditional vacuums. The Navigator does not have the same maneuverability, but it does come equipped with smooth glide wheels so that it can run smoothly over all kinds of floor surfaces. The second important difference is that the Navigator has two unique motor systems so that you can use it on carpeted surfaces as well as hard floor surfaces. When running the Shark Navigator on hard surfaces you can turn off the rolling brushes to avoid damaging the floor surface. The Shark Navigator Lift Away has a detachable canister so that you have some portable cleaning ability. That makes it easier to clean upholstery and hard to reach places. The Navigator has some included accessory attachments for this purpose such as a twenty four inch crevice tool and a premium pet power brush for removing stubborn pet hair from upholstery. The Shark Navigator Lift Away also comes equipped with Anti-Allergen Complete Seal Technology. This means that 99.99% of the dust captured stays inside the vacuum. Consumers with allergy problems will appreciate this feature because often times, running a vacuum stirs up a lot of dust that starts a sneezing attack or creates problems with watery eyes. Ultra-light weight and convenient the Shark VX63 2 in 1 cordless hand and stick vac is the perfect partner for prepping the floor before using the shark steam mop. With its powerful suction it effectively picks up dirt, hair and food particles from hard floor surfaces and low pile carpet. Extremely versatile this 2 in 1 vacuum becomes a powerful hand vac with a crevice feature that is perfect for corners and tight spaces. As a stick vac, with shark swivel steering, a motorized brush and powerful suction it is perfect for both bare floors and carpets. The removable battery charges anywhere and the telescopic handle adjusts to different heights. Accessories included are rechargeable battery, battery charger and foam filters. There are two products by Shark that fit into the category of upright cordless sweepers. The first is the Shark Cordless Stik Vac. This product is great for cleaning on both carpets and hard floor surfaces. There are two brush speeds so that you can switch from one to the other with a push of a button. For a cordless machine, there is an incredible amount of suction and it is quite effective at picking up hair, ground in dirt, and spills of larger pieces of food. The handle of the Stik Vac is telescopic which means that when it is convenient for you, you can lower the handle and convert the Stik Vac into a handheld vacuum. In its handheld form, you can use the Stik Vac on upholstery or stairs. Since it only weighs six pounds, it is quite portable and easy to move around with. It even comes with a crevice tool that is stored on the unit for use in the seams of your furniture. When it is in the upright position, the swivel steering makes it easy to maneuver the vacuum around any obstacles like furniture. It is almost as maneuverable as the Swivel Sweeper G2. This vacuum will run for about fifteen minutes before needing to be recharged again. The initial charge of the rechargeable batteries that power the Shark Stik Vac takes twenty four hours. 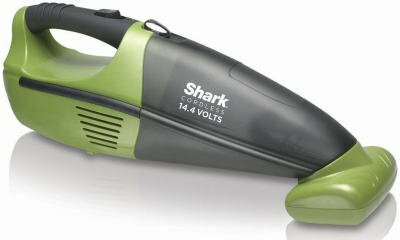 Shark recommends that you fully charge and then fully discharge the vacuum cleaner three times in the beginning in order to get top performance out of your batteries. Shark also recommends that you fully discharge and charge for twenty four hours about once a month to get the longest life out of your batteries as possible. The included rechargeable batteries should last between twelve and sixteen months if you use the machine an average of four time per week. The Shark Cordless Floor and Carpet Cleaner is a somewhat similar machine. It uses a brush and dust cup rather than a dust canister. No do not have to handle the dust cup at all though because it empties with the touch of a button. The motorized brush has settings for both carpet and hard floors. Just like the other cordless vacuum, this upright sweeper is lightweight and comes equipped with swivel steering for easy handling. The handle on the floor and carpet sweeper is something special because it has a hinge in the middle that lowers the upper part of the handle down at an angle so that you can roll the sweeper under pieces of furniture, etc.. Shark calls this innovation the Backsaver folding handle. Another Shark patented feature is the wall hugging technology that includes a motorized side brush to collect dust and debris from along the walls. The main advantage of this model over the Stik Vac is that you get about fifty minutes of cleaning time before you need to recharge the batteries. Maximizing battery life on the Shark Cordless Floor and Carpet Cleaner is the same as with other cordless products. The initial charge should be for at least twenty four hours. You should completely discharge before charging again and you should be sure to completely discharge the unit once a month. 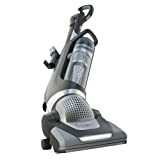 Clean your home easily with this cordless hand vacuum that features Twister Cyclonic technology to maintain suction and a motorized brush to thoroughly remove pet hair from upholstery and ground-in dirt from carpet, car mats and seats. The convenient dust cup design means no replacement bags are needed and the filter is easily detached and washable. The LED indicator light alerts you when the vacuum needs to be charged. Includes motorized brush and crevice tool. The Shark Cordless 18-vold Hand Vac performs better than other competitive models. Handheld vacuums are an important cleaning tool to have around the house, especially If you have pets that shed on your furniture. 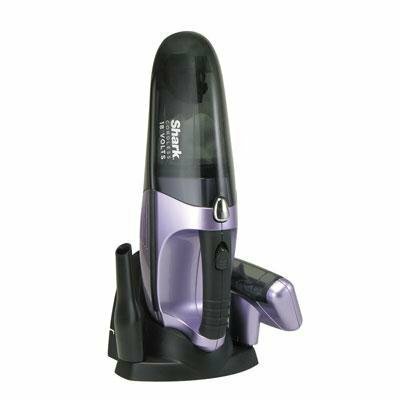 The Shark Cordless Pet Perfect Hand Vac and the Shark Cordless Pet Perfect II Hand Vac are both excellent pieces of cleaning equipment with many admirable features. First, both have powerful batteries that allow a superior amount of suction in order to pick up pet hair that clings to upholstery and ground in dirt stains. However, the Pet Perfect II with it s18 volt battery has about 35% more power than the Pet Perfect with a 15.6 volt battery. Both units have removable and washable filters so you will always have your machine with the most powerful suction possible. There are no bags to throw away, but rather a bagless dust cup. The only other notable difference is that the Shark Pet Perfect II Hand Vac has a wall mounting system and a rubberized grip for easy access and storage and more comfortable handling.